Researching SME business software can seem like a daunting task. There are a lot of accounting-only packages for companies that only need financial capabilities. And there even more enterprise-level ERP solutions for companies with big budgets that need a wide range of functionality. But if you're a growing SME business needing more than just financial software, you can be hard pressed to find the right business management software for your needs. One solution that's perfect for growing SMEs is JCurve ERP. It's a small business edition of a trusted, global ERP system, exclusive to the Australian and New Zealand market. With cloud deployment to speed up delivery of this full-featured ERP system, things are looking up for SMEs down under. See our quick video explainer, for a concise 2-minute overview. Simply put, ERP (Enterprise Resource Planning) is business management software that brings all core business functions together. Many growing businesses accumulate an ecosystem of applications over time. One system for financials, another for inventory, another for sales, and so on. Working with so many different applications can result in a number of significant issues. 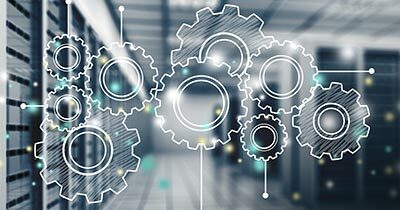 An ERP system, and in particular a cloud-based ERP, solves these common issues by leveraging single-source data, streamlining processes, and helping your business run more efficiently with the real-time data you need to make agile decisions. For a more in-depth look at ERP, see the What Is ERP Software? article and short explainer video. "Some providers refer to their software as an “ERP system” without it being the whole truth. An ERP (Enterprise Resource Planning) manages all core functionality within the one platform." You may have heard of NetSuite - the world’s largest cloud ERP software vendor. JCurve ERP is an exclusive small business edition of NetSuite. It's tailored to the Australian and New Zealand SME market and brings enterprise-level functionality to small businesses - without the big business price tag. JCurve ERP includes inventory management and warehousing capabilities, financials, sales and marketing, CRM, customer support, eCommerce integration, and more. JCurve ERP is also the first and last cloud software solution you’ll need. A direct upgrade path to NetSuite keeps you supported as your business continues to grow. Some providers refer to their software as an “ERP system” without it being the whole truth. An ERP (Enterprise Resource Planning) manages all core functionality within the one platform. It's not just a financial system with inventory bolted on or a sales and marketing system with CRM functionality. ERP is your single-source solution for all core business data and functionality. The benefits of a single-source solution become apparent when you realise there's no need to question which application has the correct, up-to-the-minute data. With an ERP, the data contained in it becomes your one source of truth. There's no manual rekeying between systems leaving you open to human error and no data mismatch errors that can happen when syncing information between systems. Particularly with cloud-based ERP systems like JCurve ERP, there's no waiting around for updated information to come through. You don't have to wait for syncing schedules to run between systems to see the latest data from different parts of the business. Your team adds their updates via a secure web interface. The moment your sales team, customer support, or finance team updates a record, the details are available. This provides a true, live view of your business and its performance. Single-source data goes a long way to improving the customer experience. Regardless of whether it’s a customer service rep, a sales rep or your accounts department which last spoke to your customer, everything is recorded in the one system. So, when a customer calls through, your business always provides them with consistent information - no matter who answers the phone. Delivering this kind of consistent, informed customer experience builds trust, respect and customer retention. Reporting becomes faster, simpler, and more accurate. You don't have to wait for your team to help collate and reconcile large spreadsheets, manually adding information along the way. JCurve ERP allows you to schedule your reports for automatic delivery. Important information about your business position can be delivered to your inbox weekly, daily or other intervals you specify. It all comes straight from the ERP system, giving you accurate reporting, without the additional human effort. 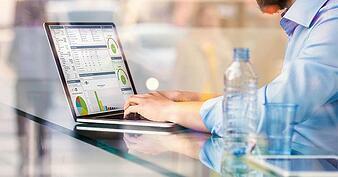 JCurve ERP's dashboards give you a single, consolidated view of business performance. And, they're customisable to roles and individuals. For example, the sales team can see report snapshots, KPI meters and trend graphs on leads, prospects, success rates of conversion to customers, monthly sales comparisons, leads to follow up, and more. The warehouse can see items to be receipted, slow-moving products, warehouse efficiency, and so on. High-level dashboards for C-level execs and business owners also make agile business decisions easier and faster. Need to know profitability, sales performance, purchasing and vendor performance? Adjusting strategies becomes much faster when important business data is available from one screen. 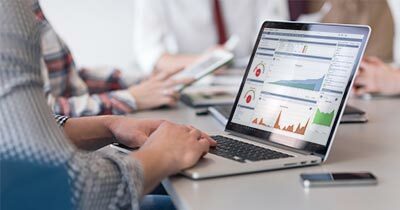 With single-source data and a cloud-ERP system that gives you live business performance dashboards with report snapshots and KPI meters, the power of a single-source ERP solution becomes clear. Find out more about business dashboards with The Benefits of ERP Dashboards: Giving You Visibility and Control. "Single-source data goes a long way to improving the customer experience. Regardless of whether it’s a customer service rep, a sales rep or your accounts department that last spoke with your customer, everything is recorded in the one system." NetSuite was founded in 1998. That’s the same year Google was established. If you remember when Google first came onto the scene, it was a time of relative technological infancy. Search engines weren’t all that smart (they didn't come close to the machine learning and AI-assisted search results being used now), the internet wasn’t that fast, and the screeching of 56K modems was an awful sound you had to endure daily. NetSuite was born as a company dedicated to delivering business applications over the internet. Some people even credit NetSuite as being a pioneer of the cloud computing revolution. It’s from these origins that NetSuite has an advantage in today’s competitive cloud computing space. Unlike other vendors, NetSuite ERP didn’t start off as on-premise software being installed on local servers. It had no catching up to do when cloud delivery become the next big thing. Instead, it was paving the way for cloud-based ERP delivery based on decades of experience as a well-established cloud software provider. Today, NetSuite is trusted by over 40,000 organisations worldwide and is the #1 global cloud ERP software suite that continues to improve and expand, year-on-year. 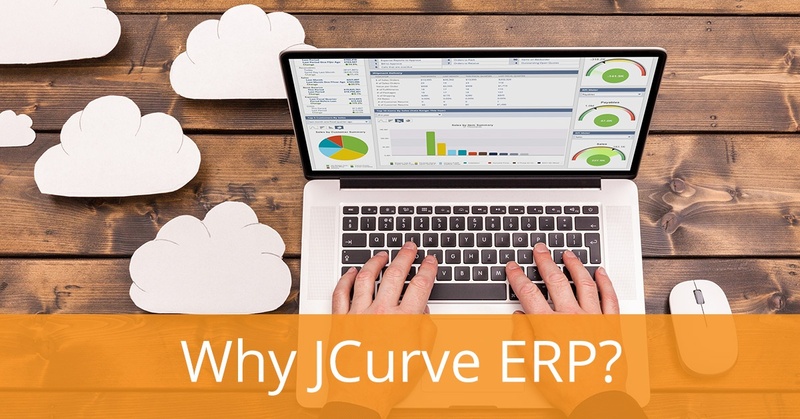 What does JCurve ERP have over other cloud-based systems? Although JCurve ERP is an SME edition of NetSuite, it's still able to leverage the enterprise-level benefits of the NetSuite infrastructure. Because NetSuite was originally created during the era of dial-up internet, its ecosystem has been built for speed, right from the start. Slow connection speeds may be a challenge for many cloud services such as media-streaming services, but not for NetSuite. Running large reports on-demand and running automated updates has been a reality for NetSuite and JCurve ERP users right from the start. Even on a mobile connection, the system remains responsive and keeps up with intensive demands. Creating a stable platform for tens of thousands of customers isn’t to be taken lightly. But this is exactly what NetSuite have achieved - and what JCurve ERP is able to leverage. Some ERP vendors coming into the cloud ERP market use 3rd party data centres – likely due to the sheer size and investment of the server equipment needed to maintain acceptable performance for users. NetSuite, however, has been continuously maintaining and building its infrastructure, right from the beginning. NetSuite has a total of 6 data centres throughout the USA and Europe. All of NetSuite's data centres feature advanced architecture with data backup and redundancy, disaster recovery, and failover capabilities. All these data safety measures working together have seen NetSuite consistently meet a 99.98% service uptime to its customers, globally. Find out more about NetSuite's data centre capabilities. JCurve ERP also uses the same open API as NetSuite. This allows communication between other systems to import additional data, automatically update information from outside JCurve ERP, and more. If you ever need to integrate with another industry-specific application, it's possible. Your data can be brought into JCurve ERP using the API infrastructure. There's no manual keying or additional human effort needed. "Although JCurve ERP is an SME edition of NetSuite, it's still able to leverage the enterprise-level benefits of the NetSuite infrastructure. Because NetSuite was originally created during the era of dial-up internet, its ecosystem has been built for speed, right from the start." Cloud-based data access may seem like a modern idea, but in reality, it's been evolving for decades now and is more a part of our everyday life than you may realise. When you access internet banking or sync your Google Chrome bookmarks and browsing history, you’re working with personal, cloud-based data that’s being held within those providers' systems. What makes the real difference is the software application security and hardware security measures that are used. JCurve ERP uses NetSuite's application security which includes Custom Attribute encryption, IP address restriction functionality, strong password policies, two-factor authentication for privileged roles, security alerts on any failed password attempts, role-level access controls and idle disconnection that keeps your data safe if users forget to log out of the system. On the hardware side, JCurve ERP uses NetSuite's data centres which all exist on fully guarded premises with 24/7 monitoring and CCTV surveillance. There’s also a dedicated, global security team keeping constant checks, along with multiple levels of security for physical access to all data centre locations. 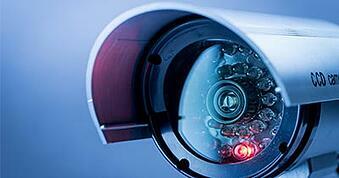 JCurve ERP's application and hardware security meets the highest standards. Could you achieve the same levels of security by using locally-stored servers on your own premises, as many on-premise ERP solutions require? Have you ever arrived home after a long day, received a text message about an urgent customer issue, and then spent the next half-hour calling sales reps to understand the background information? With a cloud-based system that’s securely accessible by desktop, laptop, tablet or phone, and provides real-time, single-source data, getting a handle on the situation is fast and efficient. Whether you're in the office, at home, or waiting for a flight, you can stay informed and stay in control. With all information stored and tracked within one platform, you have a full history of interactions with every customer, sales transactions, calendar appointments, reminders, scheduled meetings, and more. Using a single platform, sales reps out on the road also become more empowered. They can provide customers with live updates on product and stock information, access a full history of customer orders and invoices, and provide a much better customer experience. "With all information stored and tracked within one platform, you have a full history of interactions with every customer, sales transactions, calendar appointments, reminders, scheduled meetings, and more." Is JCurve ERP right for your business? JCurve ERP is an exclusive small business edition of NetSuite. It’s available to the Australian and New Zealand market for up to 20 users. JCurve ERP gives SMEs and growing businesses an accessible entry point to enterprise-level software that supports continued business growth. When JCurve ERP's 20-user limit is reached, a simple licensing update can give you access to a range of NetSuite mid-market or enterprise editions. There’s no re-implementation required, no downtime, and no need to re-train your team on system usage. JCurve ERP is the first and last ERP platform you'll ever need. With JCurve ERP and NetSuite, your business can go from startup to enterprise organisation - all on the one system. A cloud ERP system is an important investment. You’ll want to talk to a provider who has considerable experience behind them, the right business process understanding, and the best implementation methodologies to maximise the value from your investment. Starting your ERP journey can be quite different to starting off with an accounting-only system or a stand-alone CRM and sales system. Because ERP software handles all your core business functions, you'll want to organise a guided product tour or demonstration with an experienced ERP solution provider. Businesses are also as individual as people, having different requirements and different priorities. Make sure the solution provider you engage takes the time to understand your priorities and is able to tailor a demonstration to what's most important to your business. JCurve Solutions (ASX: JCS) is an award-winning solution provider and the exclusive provider of JCurve ERP. The team at JCS have successfully delivered over 600 cloud ERP implementations and counting. JCS is also Australia and New Zealand's largest 5-star NetSuite partner. With the head office is based in Chatswood, NSW, JCS offers implementation, account management, training and support, provided by an Australian-led team of ERP experts. Get in touch on 1800 528 783 or book your tailored demo to start your journey to empowering your business growth through cloud ERP technology.